Mint or pudina is a herb that is synonymous to freshness. Use it for seasoning your salad, adding it to your cup of tea or grind it, mint can bring that extra zing and unique flavour to almost anything you cook, making you salivate every single time. Mint or pudina is more than just a garnish Its awesome health benefits are bound to take you by surprise. With more then twenty varieties, spearmint and peppermint are the most commonly grown today. Mint contains vitamins and minerals including vitamins A, B, C, E, K, beta carotene, folate and riboflavin with minerals calcium, iron, potassium, magnesium and manganese. 1. In indigestion: The aroma of the herb activates the salivary glands in our mouth as well as glands which secrete digestive enzymes, thereby facilitating digestion. The menthol present in pudina helps the enzymes necessary for digestion. They relax the smooth muscles of the stomach, reducing the chances of indigestion and spasms. They can also act on these muscles to activate them and help work more efficiently to carry out digestion. In fact, mint extracts have been used to coat tablets meant to relieve symptoms of IBS. It helps muscles in the stomach relax and promotes overall digestion. Drink a cup of pudina tea after every meal by either boiling the leaves along with a few green tea leaves or on their own for maximum benefits. 3. In aches & pains: A number of pain balms use mint extracts as the main ingredient in their products. That is because when mint extract is used on an area that is hurting, it immediately provides a cooling effect, causing the area to partially become numb. This helps in lessening the pain. Another method is to inhale the fumes of mint extract. This soothes the nerves and gives a calming feeling to the entire body. It indirectly soothes aches and pains as well as nausea associated with a headache. 4. For glowing & acne free skin: Mint has a unique property that soothes and calms itchy and infected skin. It has potent anti- inflammatory and anti-bacterial properties which work wonders on acne prone skin, and is often used in a number of cleansers, toners and in some lip balms as well. The strong antioxidants present in mint leaves the skin with a natural glow and rehydrate dull and dry skin. Mint has a high content of salicylic acid which helps prevent pimples, blemishes and even helps get rid of blackheads. The compounds present in mint helps in faster shedding of dull and dry skin which in turn helps avoid clogging of pores resulting in pimple free skin. 5. In cough & cold: The strong aroma of the herb is very effective in clearing up congestion of the nose, throat, bronchi and lungs, which gives relief from respiratory disorders that often result from asthma and the common cold. As mint cools and soothes the throat, nose and other respiratory channels, it relieves the irritation which causes chronic coughing. This is the main reason why so many balms are based on mint.It is also an expectorant and helps the expulsion of phlegm, when you're suffering from productive cough. Its anti-bacterial and anti-inflammatory properties help relieve inflammation along the respiratory tract. If you are suffering from cough, add a drop of mint extract to warm water and inhale its fumes through the mouth and push out the steam through your nose. This way mint extract passes through your throat and nose relieving both the areas. 6. Prevents allergies & asthma: Mint contains rosmarinic acid that acts as a powerful antioxidant. This compound blocks allergy-producing leukotrienes and thus may be helpful for those suffering from allergic rhinitis . 7. Helps relieving menstrual cramps & pain: Since mint leaves purify the blood and have an anti-spasmodic effect on the smooth muscles of our body, it is a great remedy to relieve the pain of menstrual cramps. It also relieves nausea associated with the condition. Just brew a hot cup of mint tea and sip it several times through the day. It will make you feel calmer and soothes the uterus too. 8. Beats morning sickness in pregnant women: Due to the effects it has on one's stomach, it is a great remedy for expected mothers. It helps relieve the nausea related to morning sickness by activating the enzymes necessary for digestion. Eating a few leaves or smelling the crushed leaves of mint every morning is a great way for mothers-to-be to overcome this difficult period. A warning though, mothers should be careful not to have this after the baby is born as it is known to affect lactation. 9. Beats stress & depression: In aromatherapy, mint extract is used to beat stress and rejuvenate the mind. Breathing in the fumes of mint helps relax the body and calm the mind, freeing it of stress. It releases a small amount of serotonin in the brain that also helps beat depression. If you are feeling low, add a little mint leaves or mint extract to your bath water, or use mint extract on a vaporizer to get some relief. 10. 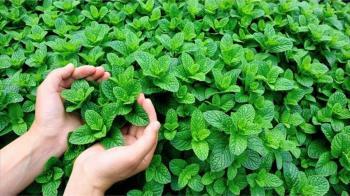 Helps fight cancer: Mint has a potent phytochemical that can prevent various types of cancers. Called perillyl alcohol, the phytonutrient has shown the capability of preventing skin cancer, colon cancer and lung cancer in animal studies. Its benefits in this particular area are still under the scanner when it comes to humans. 11. Skin Care: While mint oil is a good antiseptic and anti-pruritic material, mint juice is an excellent skin cleanser. It soothes skin and helps to cure infections and itchiness. In addition to being a good way to reduce pimples, it can even relieve some of the symptoms of acne. Its antipruritic properties can be used for treating insect bites like those of mosquitoes, honeybees, wasps etc.. The cooling sensation will relieve you of the irritating sensation and the constant urge to scratch, and the anti-inflammatory nature of mint will bring down swelling. In that same vein, mint oil is often a basic component of bug repellent products like citronella candles, because the strong aroma is unappealing to most insects. 12. Oral Care: Improving the health of a person's mouth is a well known benefit of mint. Since it has germicidal qualities and quickly freshens breath, it adds to oral health by inhibiting harmful bacterial growth inside the mouth and by cleaning the tongue and teeth. That is why mint is used to be rubbed directly on the teeth and gums to refresh the mouth and eliminate dangerous forms of germs. In modern times, for the same reason, mint is one of the most common elements in toothpastes, mouthwashes, and other dental hygiene products. Of course, the easiest way to get these results is to simply chew on the leaves.